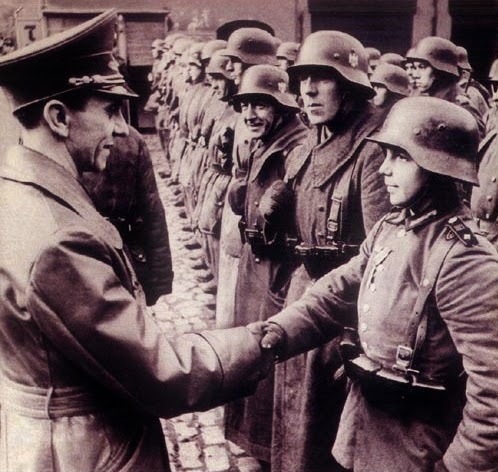 Reichspropagandaminister Goebbels congratulating 15year old Willi Hubner in Bresalu in March 1945. Willi Hubner was awarded the EKII for destroying Soviet armor during the battle for Breslau. 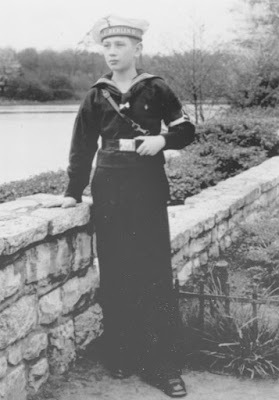 He served in the same alarm infantry unit as his Father! Top: Paratrooper SA Regiment Feldherrnhalle 1940. 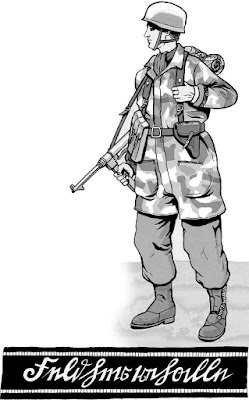 This Fallschirmjäger wears the Luftwaffe paratrooper helmet, a jump smock (which could be camouflaged), standard combat trousers and jump boots. He carries the normal infantry combat equipment, and he is armed with an Erma MPi 40 submachine gun and a Walther P38 pistol in a leather holster. On the lower left arm he wears a cuff title reading Feldherrnhalle. Bottom: Sleeve title of the SA Feldherrnhalle Regiment. The band was brown, and worn on the lower left arm. It carried the title Feldherrnhalle written in the somewhat difficult to read German Sütterlin script. This font, designed by Ludwig Sütterlin (1865–1917), was introduced in 1915 in Prussia, and gained importance in Germany from 1920 on. In 1935 it was officially adopted by the Nazi regime until it was dropped in 1941. Ernst Röhm’s name disappeared rapidly from standard reference books, as well as from the vocabulary and the consciousness of Nazi Germany. His name was removed from all SA swords and daggers of honour, and all portraits and photographs of him were disposed of. Because Ernst Röhm and his henchmen were filmed next to Hitler in the 1933 propaganda film Der Sieg des Glauben (‘The Victory of Faith’), the embarrassed Nazi Party and Führer ordered the destruction of all copies, leaving only one known to have survived in Britain. Hitler commissioned the production of another film as a replacement. The result was Triumph des Willens (‘Triumph of the Will’), directed by Leni Riefenstahl that chronicled the Nazi Party rally of autumn 1934 at Nuremberg, this time without the now hated, disgraced and dead SA leadership. After the June 1934 purge, the Nazi authorities had no clear answer to the question of what the function of the SA was to be in their new state. The Brownshirts, who had believed in Hitler as the leader of a social revolution, were disinherited by Germany, despite having marched, fought, suffered, and in many cases died for so many years in the hope of becoming the cream of the new Nazi society. After the bloody purge the SA remained a social problem in Germany. Just as 1933 had been the year of SA expansion and zenith, so 1934 was the year of decline and fall. The Nazi administration could do nothing else but maintain the permanent members within its structure. Therefore the SA was never abolished. The organisation did not disappear, but it never recovered. Many SA men were dismissed and tried to get back into civil life. Many remained unemployed and several thousand were directed to emergency work camps. Many went into the SA Reserve. Some SA men were transferred to police units and to various Nazi organisations such as the Organisation Todt (OT, public works building company), the Deutsche Arbeitsfront (DAF, the National Labour Front), or the Reicharbeitsdienst (RAD, National Labour Service). A very few were taken by the Army. The Kyffhauserbund veterans league was reformed independent of the SA and continued in its former role as an organisation for ex-servicemen. The SA Brigade Ehrhardt was purged and the remaining element, the few judged loyal enough, were detached to form part of Himmler’s SS. The SA did remain a Gliederung of the NSDAP, and although the title of Obergruppenführer was retained, the ten SA Obergruppen (districts) were abolished. The largest SA formation was now the Gruppe (division). As a reward for the role it had played in the June 1934 purge, the SS was made an independent corps, becoming a Gliederung of the NSDAP in its own right. 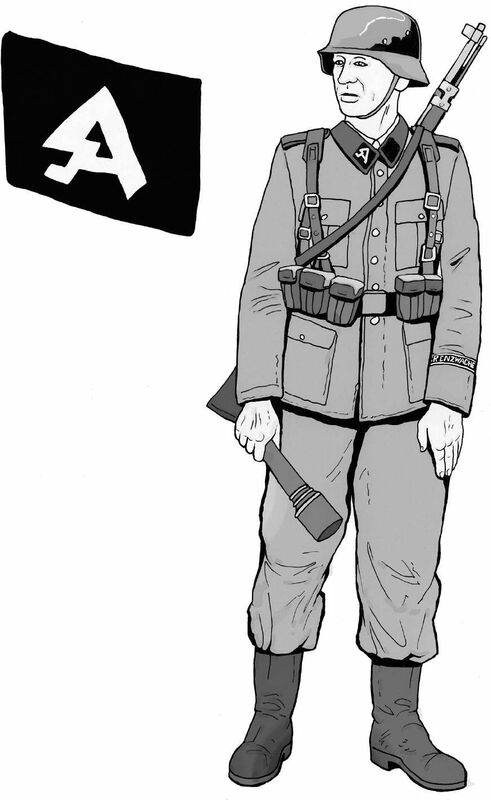 The Sondereinheiten (special military units) were disbanded. The MSA was hived off and all its vehicles and some of its members were incorporated into the NSKK, which was then raised to the status of an independent Nazi Party formation. The Flieger-SA was integrated into Hermann Göring’s newly-created DLV, which became the clandestine forerunner of the Luftwaffe . Later, in 1936, the Reiter-SA became the semimilitary Nationalsozialistische Reiter Korps (NSRK, Nazi Cavalry Corps) headed by its commander Litzmann. The SA-Marine was not disbanded. It served as an auxiliary to the Kriegsmarine and performed search-and-rescue operations as well as harbour defence. The SA Starnbergersee school survived the purge but in February 1936, control passed from the SA to the Nazi Party although the principal remained an SA officer, SA-Obergruppenführer Julius Görlitz. The title of the establishment was now NS Deutsche Oberschule Starnbergersee (National-Socialist German High School Starnbergersee). In 1941 all connection with the SA was severed. Pupils were enrolled in the Hitler Jugend , and the staff in the NSDAP. The permanent SA-Stabswachten (bodyguards) were disbanded in mid-1934, and some units were regrouped into a single ceremonial formation called the Wachstandarte (guard regiment). This was renamed in September 1936 Standarte Feldherrnhalle (after the building in Munich which housed a shrine to the fallen Nazis of the failed putsch of November 1923). The Standarte Feldherrnhalle became a small elite regiment of armed volunteers employed to guard SA senior officers, State and Nazi Party buildings and offices. To celebrate Göring’s birthday in 1936, Lutze appointed him Honorary Commander of this elite formation, which he accepted gratefully. By that time, Luftwaffe General Kurt Student was creating a paratrooper force, but found little response from the reluctant German Army. As a result Kurt Student was forced to scrounge troopers wherever he could to bring up his strength. In desperation he turned to Göring who, in a move for power, ordered that the SA Feldherrnhalle unit be incorporated into his air force. Lutze and the SA leadership were not pleased, but did not dare oppose his decision. Student was, of course, delighted, and in January 1937 the fittest members of the SA Feldherrnhalle regiment underwent training as parachutists. The unit became the embryo from which developed the Luftwaffe paratrooper force, and later a Luftwaffe infantry division. The remaining part of the SA Feldherrnhalle Regiment was transferred to the German army to form a battalion within Infantry Regiment 271. This formation expanded to regimental size in 1940, and to a fully-fledged armoured corps, named Panzerkorps Feldherrnhalle in 1945. A small detachment of SA Feldherrnhalle continued to serve under the SA as ceremonial unit until the end of the Second World War. All this considerably reduced the size of the SA from supposedly 4.5 million to about 500,000. But here again, the exact number of SA men after the reconstruction is quite unclear. Despite the reductions, the number of SA formations continued to grow, but obviously the newly created units were far below regulation strength. Thirty-six new Standarten were created in 1935, a further twenty-five in 1936, thirty in 1937 and forty-two in 1938. Many new members joined up probably because job prospects or advancement often depended on evidence of Nazi affiliation. The once feared and powerful SA organisation was completely deprived of political power. The men were relegated to a backseat role, assigned mundane tasks, and the corps turned into a veterans’ association. The days of the radical political bullies had ended with the death of Ernst Röhm and the purging of the radical elements. Never again would the SA be in a position to challenge the German Army, the supremacy of the SS or Hitler’s leadership. The SA, now chastened and disarmed, provided a physical manifestation of the power and authority of the Nazi state in public demonstrations such as the Nuremberg Party Day held in September each year. Until the end of the war in, the SA continued to exist as Nazi propagandists, as a sports organisation and as street fund collectors, but it had been deprived of any real strength. The SA continued to be an active component of the Winterhilfswerk (WHW, Winter Help League). This was the official German winter relief organisation, the ‘socialist’ aspect of Hitler’s image, which struck a chord among many of the poorer Germans who were recipient of the charity campaign. The WHW, launched in the winter of 1933/34, was organised on an annual basis by the Nationalsozialistische Volkswohlfahrte (NSV, National Socialist People’s Welfare Organisation). The NSV, headed by SS-Gruppenführer Erich Hilgenfeldt, was devoted to the welfare of party members and their families especially mothers and children. The WHW was supported by members of the SA and NSDAP, Hitler Jugend boys and girls, prominent artists, civil servants or sportsmen with the aim of collecting money, food, shoes, blankets, warm clothing and other items for the poorest Germans. With the help of voluntary contributions, the Nazis provided hot meals, warm clothes and comfort for the needy. The Jews were of course excluded from benefiting from the organisation. In the winter of 1935/36, the WHW organisation collected some 31 million Reichsmarks. In 1937 helping the WHW was made compulsory. Every worker had to pay a special winter tax (10 to 15 per cent of their salary) from October to March. During the Second World War, the Kriegwinterhilfswerk (KWHK, Wartime Winter Relief Organisation) continued the activities of the WHW, and collected for the front-line soldiers, for the widows, and for the civilian victims and homeless due to the Allied air raids. Failure to give generously could bring private threats of violence or public shame. After the 1934 purge, the SA continued to engage in the dissemination of Nazi racist propaganda and violence at a domestic level including harassing opponents and smashing Jewish shop windows. Some SA units participated to the so-called Kristallnacht (Night of Broken Glass), the anti-Jewish riots of 9 November 1938 when synagogues were wrecked and destroyed by fire, Jewish-owned stores and business premises were damaged and pillaged, Jewish homes raided and looted, Jews arrested, severely maltreated, wounded and about thirty-six of them murdered. 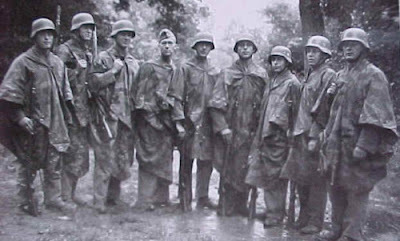 The SA was also charged of the pre-military training units of the SA Reserve and the boys of the Hitler Jugend They also trained Nazi paramilitary militias, namely the DAF Werkscharen (Work squads of the German Labour Front) and the Organisation Todt Schützkommando (OT-SK, armed protection squads of the Organisation Todt). The DAF Werkscharen were formations intended to act as the political shock troops of the DAF, which had replaced the banned trade unions. It was a huge organisation that brought all aspect of labour in Germany under Nazi control. The DAF squads saw to it that discipline, command and instruction, and Nazi order were respected in all workshops, plants and factories. The Organisation Todt (OT) was a conglomerate of public building companies developed by the Nazi regime. The OT was charged to carry out civilian public works (for instance highways), but also military projects (for instance concrete fortifications), and obviously the Organisation needed an armed police force for protection, and the OT-SK were created in 1942. The role of the OT-SK included guarding building sites against theft and sabotage, to be prepared for any surprise attack on building sites, escorting and protecting German workers, leaders, engineers and high-ranking OT officers, and the supervision and control of forced workers and slave-labourers on and off building sites. For these various training purposes, a new branch of the SA, known as SA-Wehrmannschaften (defence teams), was created in January 1939. The SA Wehrmannschaften were composed of all able-bodied males other than those who were already members of the SS, NSKK or NSFK, and who had completed their two years’ military service. These units were also assigned as auxiliary military police and some of them, in 1942, were organised as anti-partisan forces in Yugoslavia. By that time, the SA-Werhmannschaften were also responsible for overseeing the allocation of men and support to the Heimatflak (Home anti-aircraft artillery), Stadwacht (Auxiliary Urban Police) and Landwacht (Auxiliary Rural Police). 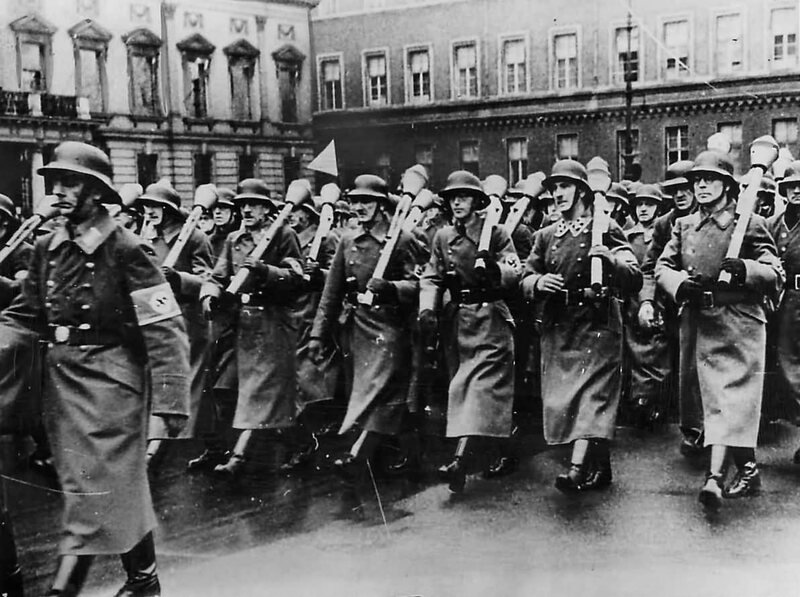 SA units were among the first in the occupation of Austria in March 1938. The SA supplied many of the men and a large part of the equipment, which composed the Sudeten Freikorps of Konrad Henlein (the Czechoslovak pro-Nazi, pan-Germanic nationalist leader), although it appears that the corps was under the jurisdiction of SS during its operations in Czechoslovakia. A very little known unit deriving from the SA was the Verstärkter Grenzaufsichtsdienst (VGAD, Reinforced Border Surveillance Service) created in 1939 at Danzig (today Gdansk in Poland) from the SA Brigade VI. As the title implies, the VGAD was intended as a paramilitary unit for patrolling the frontiers around the Free City of Danzig and as an extra defence against the Poles. Members of the VGAD usually wore standard German army uniform with a black collar displaying the SA collar patch and a sleeve title reading Grenzwacht (Border Guard). During the invasion of Poland in September 1939 members of the VGAD fought as part of the Sonderverband Danzig (Special Detachment Danzig), also named Brigade Eberhardt after its commanding officer Generalmajor Friedrich Eberhardt. This unit is principally remembered for capturing the central post office of Danzig after heavy fighting. 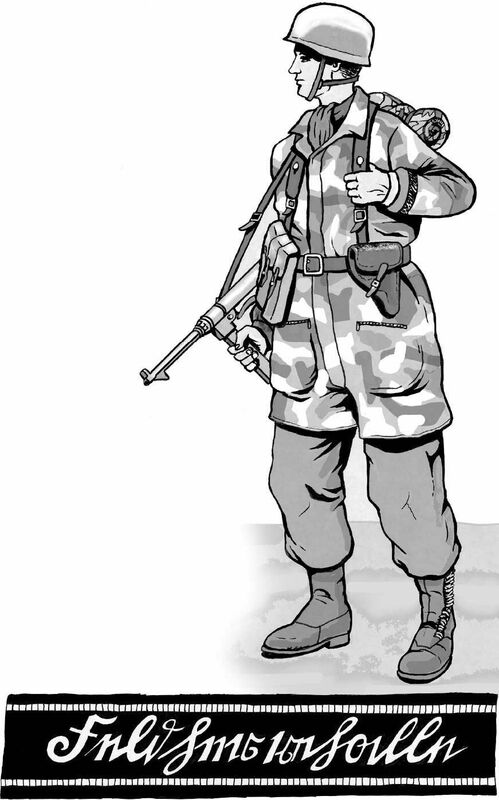 When WW II broke out in September 1939, the strength of the SA was greatly depleted, as many of its younger and fitter members were drafted into the Wehrmacht . Unlike the SS, the SA did not establish itself in the occupied territories, once several European nations were defeated and occupied. From then on the SA was composed in majority of partially disabled men or those deemed unfit for regular military service, as well as older senior members of the Hitler Youth, and older men not serving in the army reserve. After the occupation of Poland, the SA Group Sudeten was used for escorting prisoners of war. Units of the SA were employed in the guarding of prisoners in Danzig, Posen, Silesia, and the Baltic States. Groups of the SA were involved in the ill-treatment of Jews in the ghettos of Vilna and Kaunas. On 26 May 1943 SA commander-in-chief Obergruppenführer Viktor Lutze, always a minor figure in the Nazi hierarchy, was killed in a car crash while on a food-foraging expedition outside Berlin. Other source asserts that he was murdered in a partisan ambush. Whatever happened, he was replaced with the even more colourless and obedient SA-Obergruppenführer Wilhelm Schepmann (1894–1970). 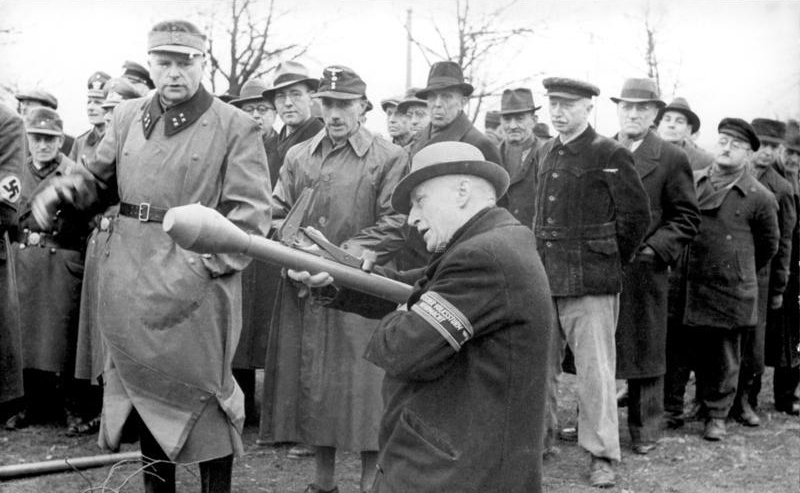 Hitlerjugend training in what was known as the Marine-HJ, the naval Hitlerjugend. In northern Germany, it was very popular for the Hitlerjugend to join the Marine-HJ, which reached a total membership of nearly 62,000 boys. As in the case of other special formations of the Hitlerjugend, the Marine-HJ demanded great mental and physical accomplishment. Before the war, all the necessary sailing certificates could be obtained, and each member had the opportunity to sail on vessels used by the German Navy for the training of its naval cadets. Adolf Hitler was obsessed with youth as a political force, and the creation of the Hitler Youth or Hitlerjugend enabled him to meet this goal. He was able to use this uniformed army of teenagers not only for promoting the myth of his own ‘invincible genius’ but also in war. The Hitlerjugend had been for a number of years trained in diverse para-military skills. The most elite formations were the boys who served in the special units of the Hitlerjugend. In the Flieger-HJ or air training Hitlerjugend, there were more than 78,000 boys alone that had joined during the 1930s. Wearing their distinctive Luftwaffe blue uniforms with light blue piping and the armlet of the Hitlerjugend, they were trained in almost all aspects of aviation. Most members, between the ages of fourteen and eighteen in the Flieger-HJ, tried to obtain his ‘wings’: the A, B and C certificates in gliding. Another special formation of the Hitlerjugend was the Motorized-HJ. Nearly every teenager from the age of sixteen onwards obtained his first driving licence for a motor cycle. But driving was only one part of the training. Not only did they learn a sound knowledge of both German and international traffic codes, but they also expertly trained in motor mechanics. The ultimate purpose of this training was self evident, as it would later serve in the motorized units of the Wehrmacht. In northern Germany, it was very popular for the Hitlerjugend to join the Marine-HJ, the naval Hitlerjugend, which reached a total membership of nearly 62,000 boys. As in the case of other special formations of the Hitlerjugend, the Marine-HJ also demanded great mental and physical accomplishment. Before the war, all the necessary sailing certificates could be obtained, and each member had the opportunity to sail on vessels used by the German Navy for the training of its naval cadets. Apart from the main formations of the Hitlerjugend, there were also a number of smaller components, including a signalling unit which did not commence until during the war. Another group formed was the Reiter-HJ, a cavalry unit which attracted mainly boys in rural areas. When war broke out in 1939, a special unit of teenagers was created to be Hitlerjugend air-raid wardens. During these first months of war, about 1,091,000 Hitlerjugend were deployed for the war effort. Most of them were given meaningful tasks to help the German war economy. They were asked to collect from house to house scrap metal, copper, brass, razor blades, paper and bottles. And while one group collected, another stood in the background and sang German folk songs. 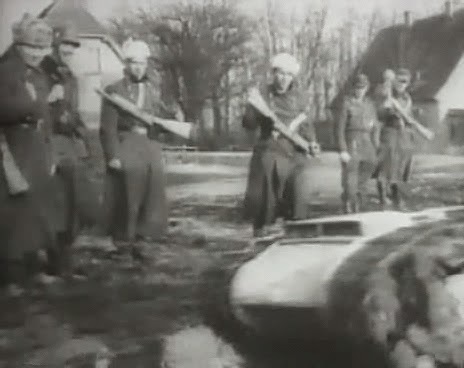 While the majority of the Hitlerjugend participated in the collection drive towards strengthening Germany's war machine, other parts, notably the para-military wing of the movement, were in full training. By the time Poland was defeated at the end of September 1939, vigorous military training was intensified. The intensification of their training was to gear Hitler's youth movement for fighting on the battlefield. Initially, those being recruited were expected to meet very stringent criteria. Every volunteer had to be fit with excellent racial features and produce a certificate of good behaviour from the Police. During their training programme new recruits were indoctrinated into an almost fanatical determination to obey the Führer, even if it meant shedding one's own blood on the battlefield. Though many did not know it, Hitler was already planning to create a military force out of the Youth. Out on the battlefield the war had not gone to plan and many thousands of soldiers had perished as a consequence. The failure to capture Moscow in late December 1941 had been a complete disaster for the Germans on the Eastern Front. Germany's forces had altered out of recognition from its victorious summer operations. Due to the considerable recuperative powers of the Heer, in June 1942 another German summer offensive was launched. However, instead of attacking Moscow again Hitler ordered Army Group Centre to consolidate its positions whilst Army Group South advanced to the Caucasus and the Volga. The outcome of this grand manoeuvre saw the loss of Stalingrad and German forces being pushed back westward. By July 1943 when the Germans unleashed their long awaited summer offensive codenamed ‘Operation Zitadelle’, the war in the East changed forever. Within two weeks of the attack, the offensive was abandoned, primarily due to a shortage of infantry replacements, the Allied invasion of Sicily and the heroic but costly Soviet defence. With stalemate on the Eastern Front, in the West the Allied bombing campaign over Germany intensified. In late 1943 Hitler began suspecting that there would soon be an Allied invasion of France and this would plunge Germany tactically into fighting a three-front war. With manpower at its lowest ebb Hitler was determined more than ever to try to relieve the problem by turning to his youth movement. In his eyes they had been prepared for war with extensive military training. Now he was determined not only to see them fight on the battlefield, but to see them serve in an elite Waffen-SS formation. This would be alluring for the young recruits. By fighting in the realms of the SS order they would not only follow his orders to the letter but would not be afraid to shed their blood on the battlefield. By late 1944 much of the war was being fought on the German frontier, the army had to cooperate with the Nazi Party’s civilian agencies in defending the homeland. In theory, this cooperation should have proceeded smoothly. OKH guidelines from August 1944 directed that civilian agencies such as the police, medical services and economic bodies advise their own personnel about what to do in case of enemy attack. In turn, those personnel were to coordinate with local Wehrmacht commandants in the preparation of defences. In reality, however, such joined-up thinking was often sorely lacking. Army officers were especially frustrated when the party’s own Reich defence commissars had primary responsibility for building defences, for many of these officials were incompetent. In Aachen in western Germany, for instance, they threw wild parties for themselves while defensive ditches were being dug in front of the city. They also failed to evacuate Aachen’s civilian population before the area became a war zone. But the failure of the bomb plot undoubtedly eroded the army’s remaining power over military policy. Above all, it ushered in structural changes that further benefited the SS at the army’s expense. By February 1944, Waffen-SS generals were already being appointed to high positions in several areas of military administration, and a few days before 20 July, Hitler decided to award Himmler control of fifteen new Volksgrenadier (People’s Grenadier) divisions. Now, in the aftermath of the plot, Hitler hailed the Volksgrenadier divisions as the vanguard of the new, fanatical National Socialist people’s army that would emerge following the purging of the July traitors. 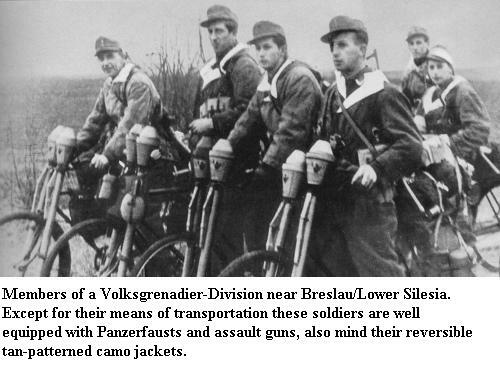 In the event, the mainstay of the Volksgrenadier divisions consisted of hastily trained, patchily equipped and poorly officered youngsters from the 1926 and 1927 intakes. Himmler had to press-gang much of their manpower, throwing in ethnic Germans, returning convalescents, Luftwaffe and navy personnel, sixteen-year-old boys and German railworkers to plug the gaps. General Balck’s memoirs describe the condition of the Volksgrenadier divisions as ‘abominable for the most part’. Rundstedt was particularly scathing after the war about the decision to conscript non-Reich ethnic Germans into the divisions: ‘We expected a so-called Volksdeutscher soldier to give his life and blood whilst his relatives were in a concentration camp in Poland.’ Nevertheless, Volksgrenadier units led by experienced officers and NCOs would come to give a better account of themselves, at least until those leaders were killed, wounded, or captured. The regime would raise a great many such divisions – forty-nine in total – and Himmler’s control over them constituted a major incursion into the military sphere. Hitler also implemented a massive SS power grab against the army’s own existing remit; now that the Replacement Army had proved itself a subversive cesspit in Hitler’s eyes, he placed Himmler in charge of it, and appointed SS men to key positions within it. Himmler was also placed in charge of the new German ‘home guard’, the Volkssturm. Volkssturm units were inferior even to Volksgrenadier divisions; they could include virtually any man aged between eighteen and fifty-five who was not yet in uniform, and in time, Hitler Youth units comprising boys as young as fourteen would be incorporated into them as well. Regular army soldiers viewed the Volkssturm with a mixture of puzzlement (‘I don’t know, this Volkssturm business is all strange to me,’ wrote Lance Corporal Hans B. from his barracks in Landsberg), derision (they often mocked the Volkssturm men as Opas or grandpas), and sympathy. ‘Were the authorities going to stop the Red Army with them?’ wrote Guy Sajer after the war. ‘The comparison seemed tragic and ludicrous.’ But Volkssturm units at least freed up regular army troops from non-combat duties. And, as their performance at the front would later show, although they were deficient militarily, they were by no means useless if deployed in the right way. 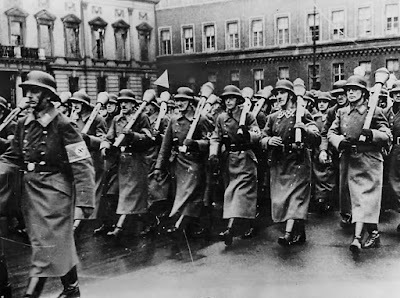 In the straitened circumstances of the autumn of 1944, Hitler saw the Volkssturm, like the Volksgrenadiers, as a vital addition to German military manpower. Indeed, as many as 650,000 Volkssturm men may eventually have ended up fighting on the eastern front alone. Moreover, Hitler and the Nazi leadership, particularly Bormann, saw the Volkssturm as anything but an exercise in barrel-scraping. In their belief that, with the ‘traitors’ out of the way, they had an opportunity to renew and fanaticize the German war effort, they saw the Volkssturm as a further means of indoctrinating and mobilizing the entire German people. Hitler also believed that the existence of the Volkssturm, like that of the Volksgrenadiers, would enable the Reich to face the invading Allies with a true people’s army, one whose sheer size, determination and fanaticism would grind the Allies down. With deep defences capable of sustaining a First World War-style stalemate, German willpower and fanaticism would best Allied mechanization and resources. In Guderian’s words, the Volkssturm would show the Allies that there were ‘85 million National Socialists who stand behind Adolf Hitler’. The fact that Hitler entrusted overall control of the Volksgrenadier divisions and the Volkssturm to Himmler highlighted his belief not only that fanaticism could stop the enemy, but also that the SS could be far more trusted than the army to harness it. Hitler restricted the army’s own control over Volksgrenadier and Volkssturm formations to matters of tactical deployment. As it was, Himmler’s control of the Volkssturm soon brought him into a turf war with Bormann. Now that the Reich had lost most of its occupied territory and the war was coming to Germany itself, the guileful Bormann believed that Himmler’s influence had peaked and that the time was ripe for the Nazi Party to strengthen its control over the German people. But this particular turf war excluded the army; indeed, when General Burgdorf tried to increase the army’s influence over the Volkssturm, Bormann was able to frustrate his efforts. One of the most famously poignant images of the war’s final months is that of barely trained, Panzerfaust-armed fourteen-year-old Hitler Youth boys being sent to die against Allied tanks. But with its replacement system now collapsing rapidly, the army’s own final levy comprised schoolboys who were little older, recruited well before their studies had ended and given perfunctory training at best. So-called infantry and Panzer divisions were raised from local schools and garrisons. At the end of February, six thousand boys born in 1929 were called up to strengthen rear defence lines. A measure of how far desperation was breaking all taboos was that there were even calls for a women’s battalion. Volkssturm units brought some benefit, as long as they were used for static, particularly urban defence, and properly incorporated into the wider plans of the local Wehrmacht and party authorities. Too often, however, the party authorities would shift Volkssturm units without Wehrmacht consent and leave them dangerously exposed. Wehrmacht commanders themselves often failed to inform Volkssturm units about their plans, and at times sacrificed them as a rearguard while they got their own men out. Volkssturm units in the east sometimes fought fanatically, partly because of inherent anti-Slavism, partly to avoid being captured. For Army did not kill them on capture, as older men they were less likely to survive Soviet captivity. The OKH also made reasonable efforts to integrate Volkssturm units into its plans. Conditions in the west were often the polar opposite: the OKW overlooked the Volkssturm, and Volkssturm men did not particularly fear the prospect of capture by the Western Allies, save by potentially vengeful French troops. Volkssturm units in the west, then, often performed poorly or disintegrated entirely. And sometimes army units dissolved Volkssturm units themselves, palming off the better personnel to replace their own losses before sending the rest home. Adolf Hitler is now considered one of the world's most ruthless madmen. Yet this was not always the case. In fact, Hitler was idolized by the German people and with the aid of Josef Goebbels, he was deified by the German youth. Operation Werwolf – Did the Nazis Really Plan for a Post-War Insurgency? Operation Werwolf - Did the Nazis Really Plan for a Post-War Insurgency? JUNE 5, 1945 - The war in Europe had been over for less than a month when a massive explosion rocked the city of Bremen, Germany. The blast ripped through a U.S. military outpost killing more than 40 civilians and American servicemen. During the last months of 1944 the situation for the German soldier on the Eastern Front was dire. They had fought desperately to maintain cohesion and hold their meagre positions that often saw thousands perish. By September 1944 they were still holding a battle line more than 1,400 miles in overall length, which had been severely weakened by the overwhelming strength of the Red Army. To make matters worse troop units were no longer being refitted with replacements to compensate for the large losses sustained. Supplies of equipment and ammunition too were so insufficient in some areas of the front that commanders were compelled to ration ammunition to their men. As a consequence many soldiers had become increasingly aware that they were in the final stages of the war in the East, and this included battle-hardened combatants. They had also realized that they were now fighting an enemy that was far superior to them. As a consequence in a number of sectors of the front soldiers were able to realistically assess the war situation and this in turn managed to save the lives of many that would normally have been killed fighting to the last man. In spite of the adverse situation in which the German soldier was placed he was still strong and determined to fight with courage and skill. During the last six months of the war the German soldier had expended considerable combat efforts lacking sufficient reconnaissance and the necessary support of tanks and heavy weapons to ensure any type of success. Ultimately, the German soldier during the last months of the war was ill prepared against any type of large-scale offensive. The infantry defensive positions relied upon sufficient infantry ammunition supply and the necessary support to ensure that they would able to hold their fortified areas. Without this, the German soldier was doomed. Commanders in the field were fully aware of the significant problems and the difficulties imposed by committing badly equipped soldiers to defend the depleted lines of defence. However, in the end, they had no other choice than to order their troops to fight with whatever they had at their disposal. In the last months of the war German forces continued retreating across a scarred and devastated wasteland. on both the Western and Eastern Fronts, the last agonising moments of the war were played out. Whilst the British and American troops were poised to cross the River Rhine, in the East the terrifying advance of the Red Army was bearing down on the River oder, pushing back the last remnants of Hitler’s exhausted units. Due to a serious lack of troop reserves many parts of the front were now defended by a mixed number of local militia, postal defence units, locally raised anti-tank groups, Wehrmacht, Waffen-SS and Allegemeine-SS formations, Hitlerjugend, and units of the Volkssturm. But surprisingly, even in the rank and file of the Volkssturm, morale remained high. For these ordinary men of Germany’s Home Guard units they needed no propaganda to urge them on. They knew, like all those defending the Fatherland that they were fighting now to defend their homes and loved ones. All that what was left to them was their skill and courage. Everything else, guns, planes, and armoured vehicles had already been sacrificed. Spread among these under-armed forces was a mixed bag of strong and weak Wehrmacht and Waffen-SS troops. In some areas of the front there were good defensive lines comprising mazes of intricate blockhouses and trenches. Towns that fell in the path of these defensive belts were evacuated. Thousands of women, children and old men were removed from their dwellings and some were actually pressed into service to help construct massive anti-tank ditches and other obstacles. A typical strongpoint deployed along the front during the last weeks of 1944 contained MG 34 and MG 42 machine guns on light and heavy mountings, anti-tank rifle company or battalion, a sapper platoon that was equipped with a host of various explosives, infantry guns, anti-tank artillery company which had a number of anti-tank guns, and occasionally a self-propelled gun. Operating at intervals were Pz.kpfw.IVs, Tigers, Panthers tanks, and a number of StuG.III assault guns, all of which were scraped together. This front-line defensive belt was designated as a killing zone where every possible anti-tank weapon and artillery piece would be used to ambush Soviet tanks. Whilst an enemy tank was subjected to a storm of fire within the kill zone, special engineer mobile detachments equipped with anti-personnel and anti-tank mines would quickly deploy and erect new obstacles, just in case other tanks managed to escape the zone. If the crew from a disabled tank had survived the initial attack and bailed out, special sapper units were ordered to pick off the unwary. However, whilst it appeared that the Germans were prepared for a Soviet attack, much of the equipment employed along the defensive belts was too thinly spread. Commanders too were unable to predict exactly where the strategic focal point of the Soviet attack would take place. To make matters worse when the Russians begun heavily bombing German positions all along the frontier, this also severely weakened the strongest defensive lines. Along the frontier of the Reich the German defensive lines were soon turned into a wall of flame and smoke as the Russians launched their attacks. For the Volkssturm and Hitlerjugend, many were going into action for the first time, and a number of them felt excited at the thought of fighting an offensive that their Führer had said would drive the invaders from their homeland and win new victories in the East. But this conflict was without rule, and new conscripts soon learned the terrors of fighting superior Russian soldiers. Under-armed and under-trained, these soldiers were quickly driven from their meagre defensive positions and pulverized into the rubble. When some determined units refused to budge, the Russians ordered in their flame-throwers to burn them out. 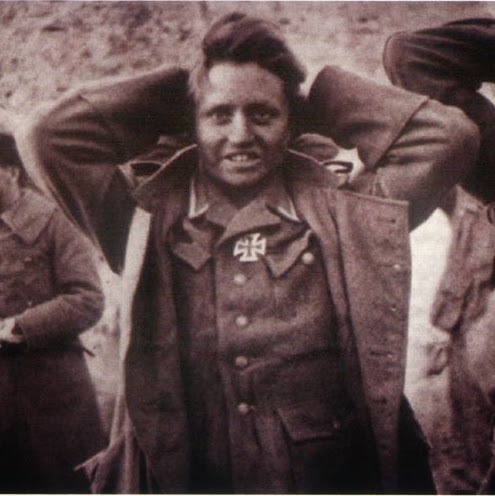 Any Volkssturm men that were found among captured prisoners were normally regarded as partisans and simply herded together like cattle and executed. In some cases, Russian tanks deliberately ran over the wounded, or hanged them from surrounding trees or lamp posts. Elsewhere along the frontier of the Reich the Red Army drive gathered momentum with more towns and villages falling to the onrushing forces. Suicidal opposition from a few SS and Wehrmacht strong points bypassed in earlier attacks reduced buildings to a blasted rubble. Everywhere it seemed the Germans were being constantly forced to retreat. Many isolated units spent hours or even days fighting a bloody defence. 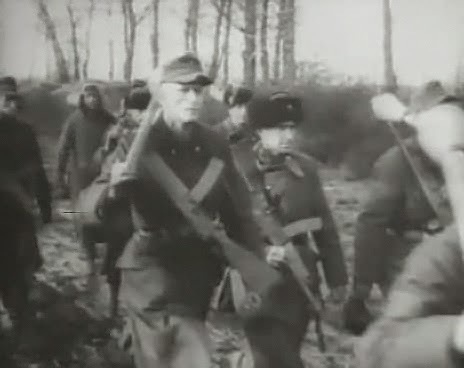 Russian soldiers frequently requested them to surrender and assured them that no harm would come to them if they did so. But despite this reassuring tone, most German troops continued to fight to the end. Of all the measures taken to mobilize speed the last manpower resources of the German nation, the most extreme was the creation of the Volkssturm designed to supplement the defense of the homeland. The Deutscher Volkssturm was constituted in September 1944. The organization may be considered a territorial militia which was formed and called to arms only for training purposes or for employment whenever a local area was threatened by the enemy. It was used to reinforce the Wehrmacht by "total commitment of all German people," as the constitution decree dictated. Although formation and training to the Volkssturm was not under the responsibility of the Wehrmacht, but rather under the auspices of the NAZI Party (NSDAP), for employment in combat all Volkssturm units came under the full operational command and control of the army. Under the status of forces as determined by the Geneva Convention, the Volkssturm was a legal irregular defense force that was neither part of the Wehrmacht nor the army, but rather an independent fighting force controlled by the Party.